GJ.7, 5c. 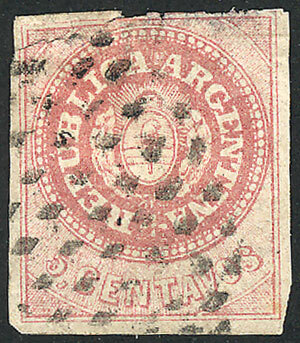 rose, with dotted lozenge cancel of Buenos Aires, tear and thin. Catalog value US$35. Lot 15 - Argentina buenos aires - Guillermo Jalil - Philatino Auction # 1916 ARGENTINA: "Budget" auction with many good lots at VERY LOW STARTS!